The end of January saw significant events in the life of the Adapt Learning community. 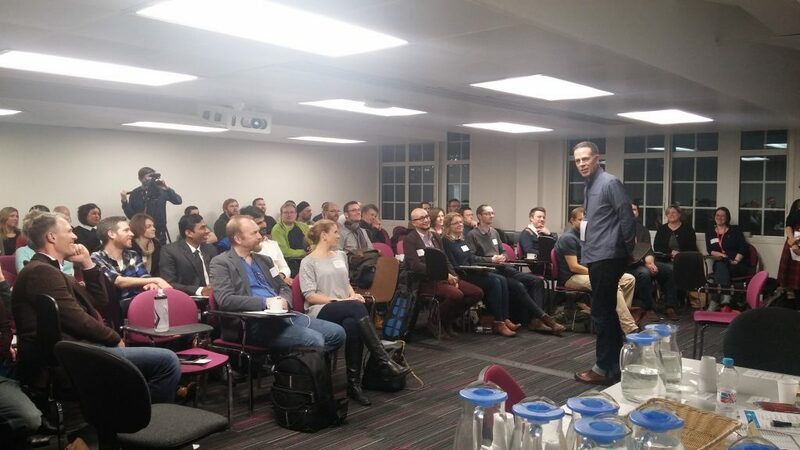 Adapt Meetup London was held at King’s College. At Learning Technologies 2017 Adapt had its first stand (that’s a booth to us North Americans). And there was a change in leadership in the Steering Group. All these happened within days of each other. Here’s a little summary of each and what I think that week signals for Adapt Learning. The Adapt community held its first public gathering at King’s College London. It’s well known that Learning Technologies is a big annual draw for learning professionals. Consequently, it’s a big draw for Adapt enthusiasts. Simon Date and King’s College offered to team up with Adapt Learning to sponsor an Adapt event the day before Learning Technologies. Adapt Meetup London was born. The afternoon was dedicated to learning. The evening was dedicated to socializing. Fifteen presentations were divided between two rooms: one dedicated to foundational topics, the other explored advanced topics. Amid the learning lingo and tech talk, what was expressed most was a shared enthusiasm. We got to see and meet other people who share a passion for excellence in learning and for delivering it to learners with technology they use every day. The community got to meet itself, to come out from behind profile pics and avatars, and to say thank you for all the help we have received from each other. Oh, and to share a pint afterwards. Adapt Learning was formed from the cooperation of learning companies. For the last several years collaborating companies used Learning Technologies to call attention to the learning they produced with Adapt. This year the Adapt project was able to help by calling attention to itself. For the first time Adapt Learning had its own stand. It was small and…well, let’s say minimalist. But is was filled with pride. It was well-staffed, sometimes with as many as five persons. And, yes, visitors kept all five busy. Time was spent on answering questions and pursuing new partnerships. Adapt Learning has a level of leadership that rarely attracts public attention. The Steering Group is responsible for making strategic and sensitive decisions that guide the project. Since the inception of the project, Sven Laux has admirably fulfilled the role of Chair of the Steering Group. It is hard to overestimate the time and passion that he has poured into Adapt. Recent work responsibilities have limited the time Sven can expend in this capacity. Sven is not leaving the project, but he has stepped down as Chair. I was elected to carry the title. Recently a member of the Adapt community asked, “Does this mean you’re now in charge?” I quickly informed him that it is typical that volunteering for such a position among other people who are also volunteering their time indicates this is a role of service, not of authority. And such is indeed the case with a community that is proudly as democratic as Adapt Learning. Like Sven, I’m passionate about what Adapt represents—the technology it offers, its approach to open source software development, its commitment to contemporary learning, and its vibrant and collaborative community. I’m happy to serve. And this role means that you will see my name more often; you will see me speaking on behalf of Adapt Learning; you will see me encouraging the community to pursue what it does best. But I’m not sure that means I’m “in charge”! What Does This Mean for Adapt Learning? Here’s my personal take. The Adapt project is entering a new phase in its development and growth. We have achieved something significant in code. We have produced a stable and robust framework capable of producing elearning modules that have rocked industry standards. I’m not going to extol its capabilities here only because this post is beginning to get long. The people involved in code development (I’m hoping that includes you) have evidenced self-governance and processes that are self-sustaining. Oh, there are definitely software milestones yet to be achieved! But it is a matter of time and hands; it is not a matter of vision and direction. The attention of the Steering Group, “leadership”, Adapt Learning (as opposed to Adapt, the software)—whatever you want to call it—can turn to a new layer of development. I’d characterize that layer as the legal and corporate structure needed to market Adapt in the way it deserves. This will happen in “fits and starts.” Some aspects remain fluid. But I’m confident that we will look back on the last week in January 2017 and see in it as a milestone in the growth of Adapt Learning.